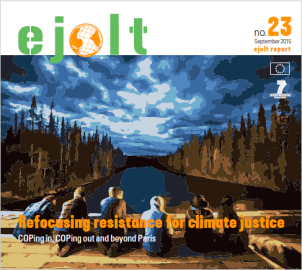 A new report by the global EJOLT project includes essays from climate justice activists and academics on how they aim to hack, resist and confront inaction and false solutions at the upcoming COP21 in Paris in December. It aims to provide background and guidelines for those who care about climate change on how they can take action in the run-up to the event, regardless if they will be in the streets of Paris. This compilation of articles aims to open space for debate on climate politics ahead of and beyond the COP21 in Paris, to give a voice to these resistances, share vital research from destructive projects and demonstrate how the UN’s lack of leadership threatens the planet and exacerbates the climate crises. In the face of paralysis from the UN, resistance to global climate injustice and inequality is alive and building from the ground up. The report is a product of EJOLT (Environmental Justice Organizations, Liabilities and Trade), an EU-funded project coordinated at ICTA-UAB, that brings together 23 research and activist organizations around the world to support Environmental Justice research and action. The report is accompanied by an EJOLT produced video shot at the Unis´tot´en camp in North-Western British Colombia showing how the camp is succeeding in stopping up to seven oil and gas pipelines, holding up billions in investment and keeping millions of barrels (and cubic metres) of fossil fuels under the ground.